We woke up at 6am. So we went straight to Prambanan. Ya, tiada mandi, cuci muka saja. Just outside our homestay there's a morning market! Prambanan Temple is different than Borobudur. i have to admit that Prambanan Temple's Carving Art is much more detail compare to Borobudur. But i am a little bit bias because i love Borobudur more since i can climb Borobudur to the top and i originally like the view from higher place! with the leftover temple in Prambanan. There are 250 temple in Prambanan before it was destroy actually. Photo above shows the leftover of some of the temple. You can search in Google to know more of the history of Prambanan Temple. it's quite interesting to know. After 2 hours exploring Prambanan we finally decided to go back to our homestay at 9.30 am. We really need to get ready for our next location. Breakfast with our leftover Instant Mee. Bathing and Packing. at around 11.30am, our Grabcar driver(the uncle from our previous trip to Borobudur) came. And we wave goodbye to our kind and friendly homestay's host. Initially we plan to take the 12.00pm train. however, since there's a lot of place we didn't get to explore in Jogjakarta we decided to postponed our trip to 4pm. I think this is the advantages of Backpacking where you can always decided when to leave. So, we asked our driver to drive us to Ratu Boko Temple and other interesting places in Jogja. When we arrived Ratu Boko Temple, the weather is so hot! which is very good for us to have some sun since it's been raining since the first day we arrive Java. Entrance fee for Ratu Boko is IDR 25k/person (local rate) and i don't really remember how much for foreigner but i am guessing around idr 160k/perosn. As usual we got local price ticket since our driver help us to get local price. Ratu Boko is famous for it's sunset view. But entrance fee after 3pm will be more expensive. it's just a small temple actually with beautiful surrounding since it's located on top of the hills. ratu Boko in Jave means " stork king". 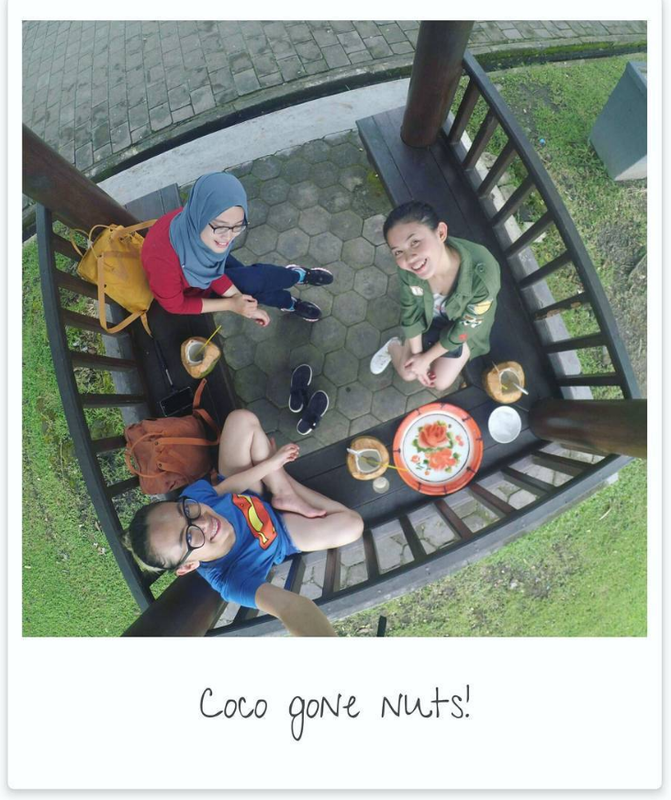 enjoying our Coconut before heading out from Ratu Boko Temple! Our next location is Tebing Breksi. I didn't know about this place actually since it was not so famously promoted in Google. But thank God, our driver told us that this place is also a nice place to visit! And yesss! it is! Tebing Breksi is probably just a normal cliff but then i don't know how they make this cliff now looking so interesting. i asked our driver if this place is a temple too and he said it was once a limestone cliff. most of the place are still in consturction when we arrived there. let's go explore the cliff! And then it's raining again! huhuhu. Since it's raining heavily, we decided to go staight to Yogya Train station at 2.30pm. Train ticket to Surabaya from Yogyakarta is IDR 105k/person. This time we have plenty of time before our train departure so we don't have to run. we depart at 4.30pm and arrived at 11.00pm. it took around 6 hours and half from Yogjakarta to Surabaya. we were then invited by our driver a.k.a tour for the Bromo trip. You can always go to Bromo and book the jeep by yourself actually. But if you plan to arrive at night like us, maybe you can order tour to fetch you. From Surabaya to Bromo took 3 hours drive. So, our nightsleep was spend in the car to Bromo.